This is the maximum religious site in Mexico. 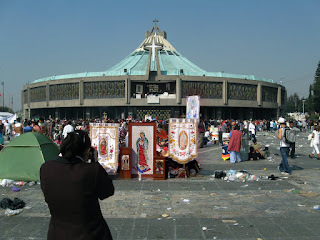 This building contains the painting of Guadalupe that appears on Don Diego's back at this spot, Tepeyac Hill. The event occurs on December 12 and thus it's the date of the annual festival and celebration of the Virgen of Guadalupe. The building is modern, it's predecessors are located near by. The entire complex is referred to by a mexican friend of mine as the "Little Vatican."